Infertility can be a painful and lonely journey. No matter what your age or how long you have been struggling with infertility, it is a difficult road to take. My journey began in 2008 after I got married and found out that I may never be able to get pregnant. I hope that by sharing my story I may encourage someone going through infertility. For years I kept my emotions related to infertility bottled up inside. No one close to me had dealt with infertility, and it seemed like no one could understand what I was going through. It wasn’t something my husband and I talked about. I felt like I was walking the road alone. I was tired of hearing what worked for other people. My body and circumstances were unique to me. Just because something worked for someone else did not mean it would work for me. I didn’t want to hear anyone’s advice. Believe me, I had read everything that was out there about how to get pregnant! The most common advice I heard was, “Just quit trying.” If only it were that easy! I was tired of being asked why we weren’t having children. I mean really, it’s a very personal subject! I dreaded Mother’s Day. When the mother’s were recognized each year at church, my stomach would get knots in it as I held back tears. I became jealous when I found out someone else was expecting. Then I would feel guilty for being jealous. I felt like I was missing out on something that I deserved. After dealing with years of infertility, I had changed into a person that I didn’t like. I was angry, unhappy, jealous, and lonely. One Fourth of July I was given my monthly notice, “You are not pregnant!” and we were to spend the day with family. I didn’t want to go and be around anyone because I was so angry that day. But I ended up going and picking a fight with a family member over the silliest thing. I looked like a fool who couldn’t control her emotions, all because I was upset with my life and not being able to be a mom. I later apologized, but I couldn’t take back what I had said. That day I decided that things had to change. It took time. But slowly, very slowly my heart started to change for the good. “God, if you want me to never have children, help me be at peace with that. I trust your plan for my life is better than anything I could ever want. I know that you will never leave me nor forsake me. I know that you have the power to give me children if that is what you want. Shortly after reading that book, I did a Bible study on Mary and read about her cousin Elizabeth. 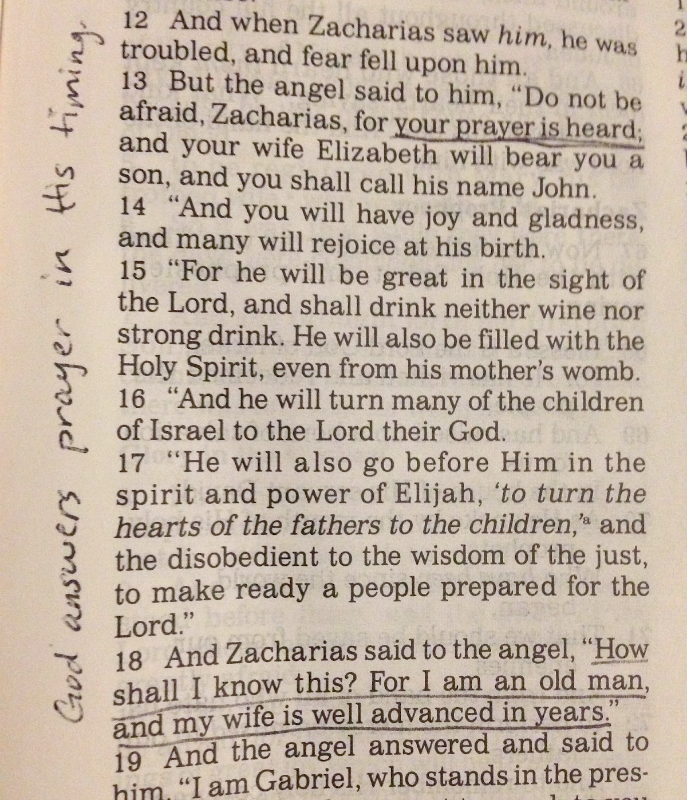 Elizabeth and her husband Zacharias were the first Isrealites to hear from God in over 500 years! And the message was that Elizabeth was going to have a baby in her old age. She waited a lifetime to have children. That is a really long time to wait to be a mom! God had a plan. Elizabeth’s son was John the Baptist and he had an important job. He was to prepare the way for Jesus! This was a reminder to me that God’s plan is ALWAYS the best plan. There is no fault in His plans. It is so hard to trust God in the midst of infertility because all we can see is the pain we are currently enduring. But He can see from beginning to end. He is with us in the present trail, and He is with us at the end of the trial. What an amazing thing to realize! After four years into my infertility journey, I heard the news that my brother and sister-in-law were expecting their second child and I cried. This time I didn’t cry out of jealousy. I cried because I was truly happy for them. Then I cried some more because I realized that I had finally gotten to the place in my life where I was crying for joy over hearing about someone else having a baby. At first infertility changed me into a person I didn’t like, but it eventually changed me into a person I did like. I learned to trust God. I became thankful for who was in my life. I lived each day as a gift instead of wishing for a life I didn’t have. I learned to stand up for myself and my feelings. Don’t let infertility steal your joy. Be the best YOU in this season. Be thankful for all that you do have. Don’t keep your emotions bottled inside. Thank you for sticking around to the end of this post! I know it was long, but I have a lot to say about this topic that is near and dear to me. Are you currently facing infertility? Or have you dealt with it in the past like me? Thanks for reading, Katheryn. Love you too! Wow, we do have a lot in common! I will definitely check out your post. I love to hear how God uses His word to comfort during the journey of infertility. I wouldn't change a thing about my story either. God used it in such a mighty way in my life. Wow, thanks for sharing. I wonder how much deep thought went into the "just stop trying" comment before it flew out of someone's mouth. As if the desire to have a baby is something you can just turn on and off at will! I found you on the Mommy Moments link up. I'm in my third year of infertility with multiple failed IVFs behind me. Infertility has been the hardest struggle of my life, but it's also taught me so much. Thanks for sharing a part of your story! I am so sorry for your struggle, Lisa. It was one of the hardest things I ever dealt with too, but it taught me so much! I found you at SHINE and first of all thank you for sharing your journey. Did you ever end up having children? Infertility is the single hardest thing I went through, but we were lucky and conceived after 7 long years and 4 surgeries. You are brave to write about it. You may have inspired me to as well. Hi Kristen. Yes, we had a baby boy in May last year! Infertility is such a hard thing to go through. I'm so glad you were able to conceive. I'm sure you would say that it was a long wait, but totally worth it! It took me a long time to write this post, and I was on the fence about sharing it for a while. But I am so glad that I did. It helped me look back on my journey, and I hope that it gives encouragement to others going through the same thing. I would love to read your story if you choose to share it! What a journey. How beautiful that you've taken the time to share your journey and inspire others with your words. I've been meaning to do a Beth Moore Bible study – thanks for the recommendation. That is actually the only Beth Moore book I have read. I thoroughly enjoyed it! Her writing is so relevant. Thank you for always hosting the link up and for stopping by. SO good! So thankful that HIS ways are perfect! He is so faithful!!!! Yes, I am so thankful that we can trust God and his plans for our lives even when times are difficult! I'm so glad it was an encouragement, Sara! My heart always goes out to others who are facing the same struggle because we share a common bond that is so hard for others to understand. I'm looking forward to following along with you on your journey!